So what are we looking at? It’s a pertinent question, particularly when confronted with an artwork by Ayling & Conroy. 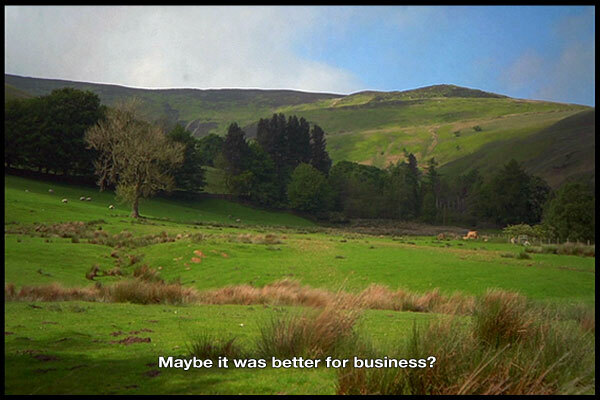 The artists ask this question in their new film Not Looking at the Hunter’s Gun, 2009, which presents a rambling, discursive tour of the artists’ collective mind. Filmed on location in the Derbyshire Dales, the visually generous film comprises three lingering shots of glorious bucolic scenery. Accompanying the images are a stream of disjointed, teasing subtitles -- as if we were flipping through the artists’ notebooks. Works in progress, glimpses into their thinking and brief insights into the range of enquiries currently orbiting their practice are all referenced by the fleeting texts. As the work unfolds, the deliberately tenuous theme that loosely ties everything together is revealed to be the somewhat broad notion of ‘landscape’. It is worth remembering, that like so much of Britain’s countryside, the heavily managed landscape of Derbyshire is a largely human construct. This fact is echoed by some of the artists’ previous artworks which are referenced in the film, such as their investigation into divergent printed reproductions of Jeff Wall’s A Sudden Gust of Wind after Hokusai, 1993 -- an artwork that Ayling & Conroy have never seen in the flesh but only know from reproductions. Wall’s digitally composited landscape, constructed from over one hundred separate photographs, was inspired by a woodblock print from Katsushika Hokusai’s popular series, 36 Views of Mount Fuji, 1830-33. Like Wall’s photomontage, the landscapes of this popular nineteenth century Japanese artist were themselves composed using a range of secondary sources. So then, the question remains: what are we looking at? Throughout their fractured and open-ended projects Ayling & Conroy ask us to gauge the role of mediation in the creation, diffusion and consumption of cultural production; they challenge us to consider the legitimacy of alternative ways of experiencing artworks. Ayling & Conroy thought they had Richter sussed; that is until they stumbled across a newspaper interview which blew their preconceptions out of the water: “Art should be serious, not a joke. I don’t like to laugh about art”, he declared. Until that moment they had always perceived a degree of humour in his artworks, but this revelation caused them to question the validity of their subjective interpretations. In response they created I, Gerhard, 2009, a project in which Richter’s artworks and writings are studied for a year in an attempt to better understand his practice. But how much study does it take to adequately comprehend an artist’s oeuvre? Artists’ writings may help us gain a deeper appreciation of their work, but they can also foster narrower readings. As Ayling & Conroy ask: “is there any value in additional viewpoints, if our ideas differ from the actual meaning?” I, Gerhard is well under way, but there are other ideas yet to be realised. A couple of subtitles refer obliquely to Ayling & Conroy’s proposal to place a sign in the hinterland landscape outside of Chongqing, a densely populated city in China’s Sichuan Province. The sign, or marker, will stand there until, eventually, the burgeoning city expands to reach it. The work could manifest itself in a number of different ways, or maybe not at all; remaining simply as an idea. Perhaps ideas are sometimes all that is needed. The majority of us would never experience a project like this in situ, rather it would be mediated via documentation, word of mouth and written accounts (such as this one). Ayling & Conroy are asking more questions: is anything more required than ideas? Can an artwork successfully exist in the imagination alone? The film’s apparent wildcard is Friedrich Nietzsche. Although seemingly unrelated to any of the artists’ other concerns, it is actually the philosopher’s relationship to landscape that fascinates Ayling & Conroy. Nietzsche often found inspiration while walking in nature; in 1881 an encounter with a towering pyramidal rock on the shore of Switzerland’s Lake Silvaplana helped crystallize his understanding of the concept of eternal recurrence -- the ancient idea that the universe is incessantly recurring, infinitely replicating itself from eternity past to eternity future -- which was the central theme of his celebrated philosophical novel ‘Thus Spoke Zarathustra: A Book for Everyone and Nobody’. Nietzsche’s subtitle reflects the highly personal nature of his work and the myriad of subjective readings he anticipated: anyone is free to read the book, but who besides the author can truly understand it? Similarly, Ayling & Conroy’s work is highly personal -- reflecting their own interests and preoccupations -- yet at the same time they provide a seductive visual hit we can all understand and appreciate. But how many of us have actually read Nietzsche? Ayling & Conroy certainly haven’t -- a fact they readily admit, thus deliberately undermining the authority of their transitory statements. Placing question marks over certain assertions immediately raises doubts about others: are there really 35 million people living in Chongqing? Did Jeff Wall actually spend five months grafting together his photomontage? With this deliberate undermining, Ayling & Conroy allude to Nietzsche’s concept of perspectivism: that all ideation is relative, thus there is no such thing as absolute truth -- but is that sentiment itself true? In Nietzsche’s novel, Zarathustra describes aphorisms as ‘mountain peaks’ or ‘summits’, suggesting vast amounts of underlying thoughts and ideas to be sifted through before they can be adequately understood. The same is true of Not Looking at the Hunter’s Gun -- but how many of us will sift? Not Looking at the Hunter’s Gun is a new film by Ayling & Conroy, commissioned by Katherine Daley-Yates for the occasion of the UWE MA Fine Art Degree Show 2009. The development of the film was instigated through a series of conversations that revolved around producing a new work that would respond to the situation of curating on a Fine Art MA. The work also builds on the commission that Ayling & Conroy produced for the previous project Responses: Three Approaches to One Space (Spike Island, 2008). The film is a continuation of Ayling and Conroy’s concern with the production, experience and mediation of artwork, and builds on previous work such as Sponsor the ICA by subtly agitating the context from within. The meditative quality of the film and gentle probing questions, musings and statements respond to the temporary didactic situation of the work. Not Looking at the Hunter’s Gun also highlights the precarious balance, between curatorial and artistic ownership. Although the artists were invited to respond to a particular context by the commissioner, they have regained partial control of the situation by curating a grouping of work of their own choice. This process of negotiation demonstrates the importance of the carefully developed relationship between artist and commissioner.